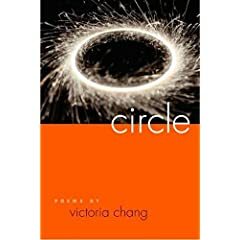 Winner of the 2005 Crab Orchard Series in Poetry, Victoria Chang’s Circle proves a startling book of steely lines radiant with imagery, irony, and transitions. In her deft hands, lines spindle into wires that probe, wrap, and connect topics and eras which appear to live in separate realms. By the book’s end, its circularity compels readers to reread in hopes of reaching the furtive heart of her lines’ mission. Readers are caught in an undulating mobius strip of Chang’s design. The design begins with desire in Part One’s opening poem, “To Want,” twelve taut couplets that probe yet twist meaning so that full satisfaction is kept just outside our reach. The first line beckons, “To wait is to want more.” The second line bends the subject to a matter of perception: “Or to think you want more” (3). It is Chang’s exacting ease in melding disparate images together that releases delight—the friction between “stitches, ” “weeds,” “accordion,” and “toys,” almost random items, smoothes in the capsule of the narrator’s “home” no less that the precise word context she crafts for those words. The backyard of perception opens to weeds which multiply in an accordion of folding mirrors which lie. A toy-strewn house stretches us to the pun in lie but features another kind of weed. By posing the question, “How many toys do children need?” the narrator casts light on the infinite gray between need and desire, stripping the rhetoric from the rhetorical question.